People, it is COLD outside. This is not the snowman-making, fort-building, fun tobogganing winter of my youth but rather the get me inside and not leave the house until I hear the birds chirping kind of bone-chilling weather. C-O-L-D. I am so over you, winter. And with the cold comes colds. We have had our share and our holidays were a bit rough with each one of us getting sick. I'm trying to rely less on traditional pills and medicines to deal with normal colds so when I found this recipe on pinterest, I thought I'd give it a try. I adapted the recipe for quantity and taste (I needed the blueberries to mask the garlic. Ugh) but it worked really well. Within a few hours, my nose stopped running and my slight fever broke. 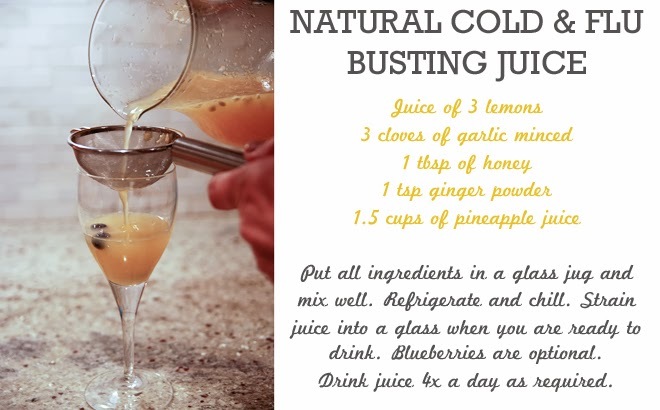 Just thought I'd share the recipe in case you're wheezing and coughing your way through the season too!